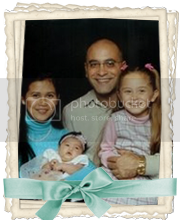 LIFE MARRIAGE AND KIDS: SHIVER ME TIMBERS! 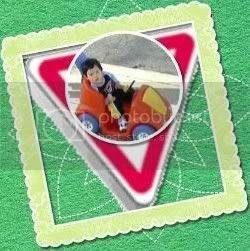 Halloween is just among one of themost anticipated event that most children look forward to. Getting to wear costume, trick or treating, decorating the house for halloween and of course the consumption of candies with parents permission,lol. This year it was just the three of us, Ralph, Kaitlyn and ME. It was Kayal's turn to spend her Halloween with her mom this year. We missed her a lot but I know she is still having fun with her mom. 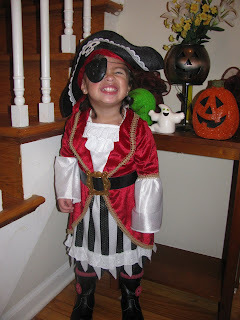 This year Kaitlyn was dressed up as a swash buckling, rebel little pirate. I never planned for her to get dressed up as a pirate. I was just checking out some outfit when I saw the one for her. 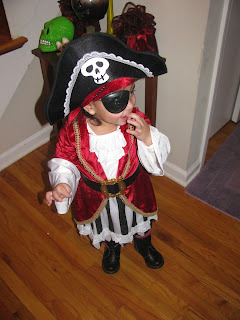 The pirate costume just screamed Kaitlyn all over it and fit her personality to a T.
Ahoy there me matey!!!! You be looking for me? Harr, harr , harr!!! Ahoy there you scallawag, I be getting this ship sailin before other scurvy dog of a Pirate get a hold of me treasures. Aha! Could this be fine fellow be a pirate in disguise? Harr, harr, harr, never ye mind he be part of me slave from now on. Aye! I be hittin the mother load of all booty, behold my loot! 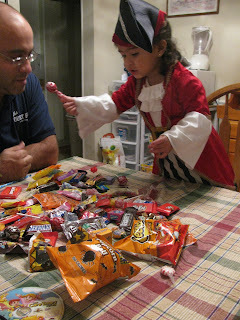 Ye be keepin yer filthy hands of me candies or else I be force to let you walk the plank. Father or not nobody steals from Captain Kaitlyn arr, arr! oh, such a cutie! 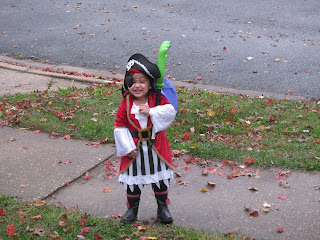 my son was a pirate, too! hahahaha I had a good laugh with your post lods, and looking at kaitlyns funny ear to ear smile. 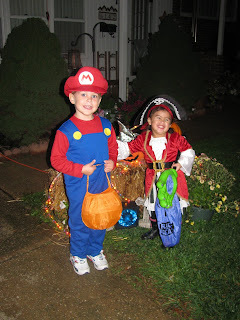 My gosh, where is the lil Kaitlyn gone, she grows quickly, and now she has BF with her trick or treating.